← 50. Have You Forgiven Yourself? Grandma gives you one of those itchy hand knit sweaters. You don’t like it, you don’t feel comfortable in it and yet, you still have to be thankful for it. “Shouldn’t you thank your Grandmother?” “Thank you Grandma,” you say dutifully. Gratitude feels uncomfortable to many people. The feeling that you have to bow to someone; that you have to be thankful for something you didn’t ask for gives being thankful a charge. You had to be thankful that your father worked so hard for the family, but Dad was gone so often and when he came home, you had to be quiet so you didn’t disturb him too much. Dad was tired from all the hard work. Maybe very many things happen in your life which are painful. Why does this have to happen to me? What now? You stumble through life and ask what you ever did to deserve this. Why should I be thankful for this life? Being thankful is charged for most people, but at the same time it’s one of the most healing feelings there is. Once you take off the charge, being thankful can bring out that wonderful feeling! Your feelings of happiness will greatly increase! Your self-healing as well! 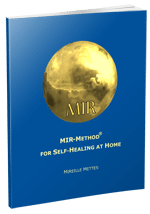 If you do the MIR-Method, you slowly but surely take the charge out of being thankful. You can polish gratitude and start to feel it again! It usually happens slowly and naturally. You notice one day that you’re more aware of everything that is successful and what is going well and what you have and are able to do. Are you familiar with Dr. Emoto’s work? He has done wonderful research into water crystals. He wrote “Thank you”, “Love” and “I hate you” on stickers and taped them to jars of water. Afterwards, he froze the water and studied the ice crystals which formed. Very interesting is that the positive words formed beautiful crystals while the negative words resulted in disturbed and unclear crystals. Look up the images of the crystals on Internet sometime. You’ll be surprised! Dr. Emoto said that, among others, Love and Gratitude, in particular, are of great importance to us! The crystal that you see at the beginning of this article is the crystal that resulted from the words “Thank you”. When you realize that we largely consist of water, what would happen to us if we were to give an extra focus to love and gratitude? What if we can get let go of the charge that gratitude has and really be able to feel it again? That you could be grateful to your ex-husband for letting you go so you have new chances to discover yourself. That you can be grateful to your parents for all the insecurity they caused so you now discover what security is and how strongly committed you are for your children. That you can be grateful to your ex-employer for firing you, because now you can finally relax and think about what you really want to do with you life. Or, a little closer to home: how nice that both of my eyes work! That my ears are so good that I can enjoy music! That I can so easily pee! That my legs are so strong and that I can easily go up the stairs! When I gave birth to my older daughter, I couldn’t do anything. I had no energy and couldn’t think straight anymore. I experienced what it is to have a body and a mind that don’t function. I am sometimes aware of how strong my legs now feel and can be intensely happy when I make new discoveries using deep thought processes. But I can also be thankful for my daughter’s hand in my hand, for the bumblebees buzzing around my flowers, for the scent after a spring rain; that the car is still working, for the cheerful cashier, that life sometimes brings a nice person on your path. What are you thankful for? Write about it below to inspire other people! Thank you!! Wishing you a heart filled with gratitude and a life full of love! I just want to say thank you for your method, I did it for two months even thou I do not know if it worked on me but I i think it helped. and thank you for all your advice. Thank you for giving the MIR-Method a try. Please remember that if ever you get health issues again, you can pick it up. Thank you Mireille, for this beautiful post. Recently I come to meet a new friend, we had lunch yesterday. We talked and discovered many things, we had same interests. We talked about dr Emoto and his wonderful ice-crystals, and about EZ-water that Prof. Pollack tells about. That must have been an awesome meeting! I am happy for you both!